At our 2013 annual conference, we talked about reshaping the way we do ministry to focus on making disciples. This week, our Cabinet met to look at our covenant and reframe our minds, hearts and spirits for the coming year, expecially exploring the concept of “New Places for New People.” The scripture passage we focused on was Luke 13: 6-9 (the parable of the barren fig tree). It was a different sort of Cabinet meeting – something we’ve never done before. On Monday I took the group to Boston to rent bicycles for a ride on the rails-to-trails path along the Youghiogheny River. We rode south for 6 miles until we came to Buena Vista. In that community is Bell Chapel, one of our abandoned churches that is being re-framed as a new place for new people, especially the new residents in the community, riders on the trail, and paddlers on the Youghiogheny River. It’s just behind the church, and would make a great spot for baptisms. The pews have been removed, the floors redone, and fresh lighting has been installed. An Eagle Scout candidate is working on picnic benches and clearing out space for camping. Grills have been put in place and easy chairs set up along the river for food and a place of rest/renewal. The hope is to acquire canoes for boat trips on the Yough. 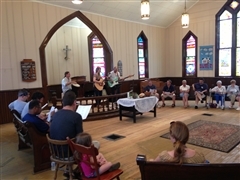 We had a praise band and communion set up. Our worship centered around how, with proper pruning and care, old trees can bear new fruit. 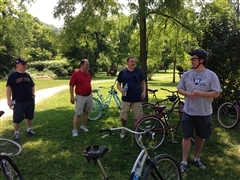 The bike ride symbolized the journey to that discovery and the sweat of the ride reminded us that the work of making disciples in the 21st Century and the process of creating new places for new people is hard, sweaty work that demands our attention and commitment. It was a great day and one that truly focused us for the work that lies ahead this next Conference year.